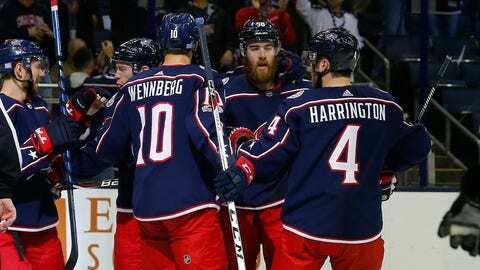 COLUMBUS, Ohio (AP) — Artemi Panarin and Oliver Bjorkstrand scored in the shootout, and the Columbus Blue Jackets beat the Boston Bruins 4-3 on Monday night after squandering a two-goal lead in the third period. Blue Jackets goalie Sergei Bobrovsky had an assist — the eighth of his career and first this season. Bobrovsky made 27 saves for his sixth win. The Blue Jackets had been plagued by slow starts but got on the board just 1:59 into the game when David Savard threw the puck toward the net and it wiggled past Rask off a deflection. Alexander Wennberg and Matt Calvert assisted on Savard’s second goal of the season. After a pair of unsuccessful power plays, Columbus found the back of the net again with less than three minutes left in the first period. Boone Jenner, playing in just his fifth game after returning from injury, scratched and clawed at Markus Nutivaara’s rebound until he put it past Rask at 17:08. Josh Anderson was also credited with an assist on Jenner’s first goal of the season. The goal was Motte’s first with the Blue Jackets and came just hours after he was called up from the minors to take the place of injured Cam Atkinson. Patrice Bergeron got the Bruins on the board with his second goal of the season, a power-play score at 15:37 of the second with a shot from the point off around-the-horn passes from Danton Heinen and David Pastrnak. It was the first power-play goal given up by Columbus at home this season, and the first the Bruins scored against the Blue Jackets with a man advantage since Nov. 30, 2013. Although Columbus dominated much of the game, its power play continued to flounder as the team failed to score all four times it had a man advantage. NOTES: The game was a homecoming for Sean Kuraly, a Dublin, Ohio, native, whose younger brother, Nick, is senior captain of the Bishop Watterson High School hockey team in Columbus. … Boston backup goalie Anton Khudobin was hurt during Sunday’s optional practice and did not travel to Columbus. … It was Panarin’s 26th birthday. Bruins: Host the Las Vegas Golden Nights on Thursday. Blue Jackets: At the Florida Panthers on Thursday.